From Dec. 27, 2008 to Jan. 17, 2009, Israel carried out Operation Cast Lead in the Gaza Strip. The aims of the operation were to stop Hamas' launching of rockets into Israel. TO UNDERSTAND the causes of the Gaza conflict, it is essential to understand the Hamas ideology. Hamas presents itself as an Islamic supremacist movement. Its charter opens with a quote from the Quran: "You [Islamic nation] are the best nation that hath been raised up unto mankind." [3: 110] However, whereas many religions and cultures believe that their own traditions represent messages of truth, Hamas believes that this supremacy of Islam obligates them to commit genocide, literally to exterminate millions of people who have different beliefs, including the Jews. Headline: "Suffering by Fire is Jews' destiny in this world and next"
It is important to note that the Hamas MP switched words in the last sentence, from the word he used throughout, "harik," which means "fire," to "mahraka" a word from the same root, that is used by Arabic speakers to mean "holocaust." "We find more than one condemnation and denunciation of the resistance operations and bombings [suicide attacks], carried out by Hamas and the Palestinian resistance branches... [Eventually] everyone will know that we did this only because our Lord commanded so: 'I did it not of my own accord' [Quran] and so that people will know that the extermination of Jews is good for the inhabitants of the worlds." 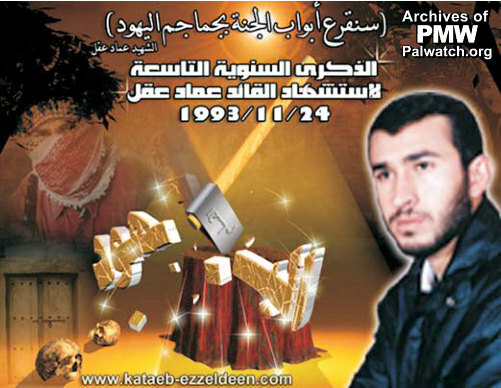 A poster that Hamas posted on its old web site taught that killing a Jew is enough to grant the rewards of Heaven. Text on Hamas poster: "I will knock on Heaven's doors with the skulls of Jews." Axe is crashing through the word: "Jews." Hamas goes even further in its religious packaging of genocide. Hamas teaches that the redemption of all of humanity, the anticipated Islamic "Hour" of Resurrection, will happen only when Muslims are killing Jews and the remaining Jews will be exposed by the trees and stones. "Hamas has been looking forward to implement Allah's promise whatever time it might take. The prophet [Muhammad] said: 'The time (of Resurrection) will not come until Muslims will fight the Jews; until the Jews hide behind rocks and trees, which will cry: 0 Muslim! there is a Jew hiding behind me, come and kill him!'" "'The Hour [Resurrection] will not take place until the Muslims fight the Jews and the Muslims kill them, and the rock and the tree will say: 'Oh, Muslim, servant of Allah, there is a Jew behind me, kill him!' We must remind our Arab and Muslim nation, its leaders and people, its scholars and students, remind them that Palestine and the Al Aqsa mosque will not be liberated through summits nor by international resolutions, but it will be liberated through the rifle." Given this Hamas ideology of genocide, the essential problem with Hamas is not the missiles and rockets it showers on Israel, but the core belief that killing Jews is a prerequisite to redemption. Hamas's ongoing attempts to kill Jews, which have led to the current Gaza War, are a symptom of the far deeper problem -- the ideology teaching that Allah demands the extermination of Jews. Israel and the West must create a strategy not only to destroy the terror infrastructures of Hamas, but to ultimately ensure that Jews and the world are safe from this ideology and its consequences.